Yep I haven't met a fellow RVer male or female that I haven't enjoyed the company of. We have been on the road for 6 months now and have met many people from all over this/our wonderful world. Being the the explorers that we are; this summer we've been traveling in the heart of the Southwest visiting areas such as Prescott Arizona. Parkers Black Meadow Landing on Lake Havasu is a must see! Editors Note: Below is a short video giving an overview of Black Meadow Landing on Lake Havasu. We have survived the desert heat which hit 118 degrees, so we wimped out and bought two Window Air Units which made it very comfortable. 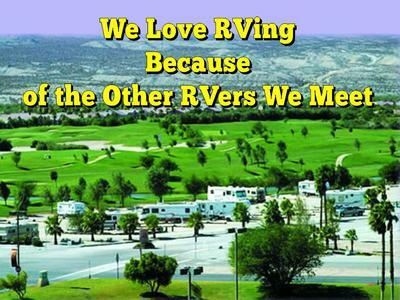 We just left Lake Havasu and are now at the RV Park at the Avi Resort and Casino in Laughlin, Nevada. The Avi Resort has a beautiful white sand beach right on the Colorado River and a gorgeous pool. The food here gets an A+ rating and is reasonable. With all these amenities and the reasonable camping rates makes the Avi Resort Casino a bargain. In addition, everyone here have been extra friendly especially to our veterans. 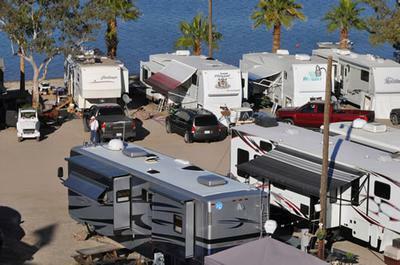 Editors Note: Below is a short video tour of the AVI Casino Resort KOA RV Campground. Join the Good Sam Club Today! Discounts, Tips, Tools & Much More!